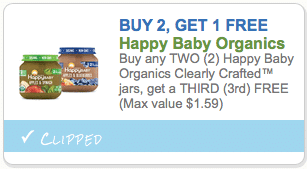 Print a new coupon for Happy Baby’s new organic baby food jars! Print as many as you can (up to 2 prints per device, including mobile) and stock up at Target on these organic baby food jars for cheap! $7.90 after coupons and gift card, so just $.53 a jar!